Club Penguin Cheats by Mimo777 Club Penguin Cheats by Mimo777: Card-Jitsu Snow Beta Test Finale! Card-Jitsu Snow Beta Test Finale! Hey hey! 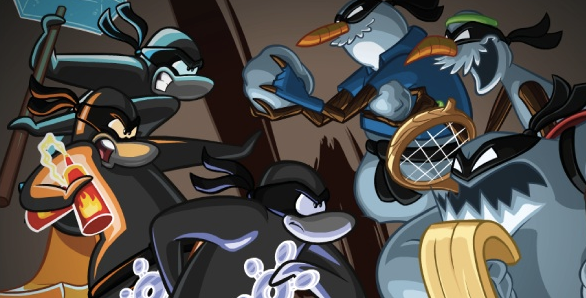 The Club Penguin Snow Jitsu Beta Test has been going great! Don't you think!? So many bugs have been found and are being fixed! Nice work, testers! The test will be ending very soon. Which means you'll only have a bit more time to collect your EXCLUSIVE Snow Beta Hat! Remember, this is the ONLY time this item will be available. It's a new rare item! And YOU can have it! Tell your friends to get it while they still can! Once the test is over the team will be working hard to fix all the glitches to get it all ready to released in a few months! Whoop! How you can get that hat? I still can't even get in! mimmo you forgot to mention the hot sauce in the newspaper! pizzaron 3000000 door)you click on the hot sauce and u get a note from the director. Same bro! Being water ninja for cj snow is my fav! Wha bout u? Where is this snow beta thing because mimo777 is saying there is very less time to get that rare hat.But i don't know where to get it. it wont let me on!? how do i get there?! Super Hero Party: Task 6! Super Hero Party: Task 5! Power Glove Fix Coming Tonight! Super Hero Party: Task 4! Super Hero Party: Task 3! Marvel Super Hero Party: Task 2! Club Penguin Super Hero Party On Now! Special Update from Spike Hike! Penguin of the Day: Thruthenite! Daffodaily5's Featured Fashion: April 22nd! Herbert's Master Plan Reviewed By You! Club Penguin Pin Cheat - ROBOT VILLAIN PIN! Club Penguin Party Decorations are on the Island! Earth Day: Random Acts of Kindness! Penguin of the Day - Leafypingu! Marvel Super Hero Takeover Sneak Peeks! More Club Penguin Coin Codes! Reviewed By You: Super Heroes! Club Penguin Better Igloo: April 2013! Daffodaily5's Featured Fashion: April 8th! Operation Hot Sauce On Now! NEW EPF Mission & Spy Phone! April 2013 Penguin Style Clothing Catalog! Club Penguin Pin Cheat - BUNNY RABBIT PIN! 2013 Squidzoid Vs. Shadoe Guy & Gamma Gal!